Want to pick up DailyMag for free? Simply sign up for UpThemes Hosting and you’ll get access to all our themes, including the brand new DailyMag theme. Publishing involves so much more than just the typing of words onto the screen and the click of the “publish” button. In fact, the most important part of sharing news is capturing the story and retelling it in the most engaging way possible. We think storytelling is the most important element of a great article, and that’s why we set out to create the best reading experience you could imagine. If you run a content-producing website, you know how important it is to optimize for engagement at every turn. 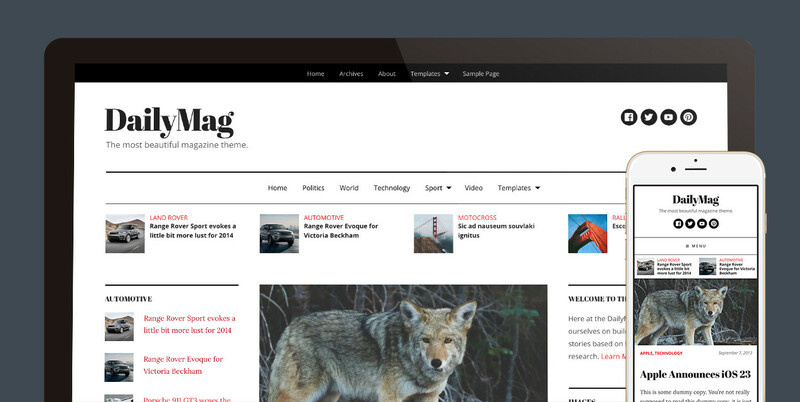 DailyMag is built to keep readers on your site, reading every article and exploring new content. DailyMag includes a number of layout options, making it easy to select a default layout and customizable your layout on a per-post basis. If you prefer a single column for a certain article or story, simply switch up the default layout for only that particular post. There are 6 different layout options included, each one giving you the ability to present content just the way you need it. Included in the theme is a simple progress indicator at the bottom of the screen showing the reader how much of the article has been read. In addition, we’ve added a feature that pops into view on any screen or device after the reader has completed reading the article, showing the next featured post. Rather than build in a bunch of features that not everyone uses, we try to add value through other plugins that are commonly used within WordPress. As with all our other themes, we have included support for Jetpack’s Featured Content, displaying a set of posts with the “featured” tag just under the primary navigation. These posts are responsive–they shrink down to two posts on smaller screens and will show just one featured post on mobile devices. DailyMag includes beautiful heading typography as well as hyper-readable body text, making your content stand out and look great on all devices and screen sizes. The design of DailyMag allows for usage in almost any industry: fashion blogs, food blogs, fitness, news websites, video blogs, and more. There are two menus in the theme (both in the header) as well as 5 widget zones: two sidebars (for two- and three-column layouts), and three widget zones in the footer. The footer widget zones automatically resize to fit the screen based on whether or not you have added widgets to them. If there are no widgets in a zone, DailyMag will automatically adjust to fit the columns into the space as necessary. If you have no widget areas, they will be hidden completely. Looks great! I like the featured article that appears when scrolling down. Keep ’em on the site!